Husband works for the school district so he’s blessed with more time off than me. I have to stock up on “Husband Friendly” food for those times when he and the onions are home without me for a stretch like the Christmas holidays and Spring break so he can whip up easy lunches without being too tempted to go to McDonald’s every day. I arm him with canned and frozen soup, pasta salads and cold cuts and hope for the best. His favorite canned soup is Bean & Bacon. He’ll make a big ol’ pile of buttered toast and knock the bottom out of two bowls without coming up for air. 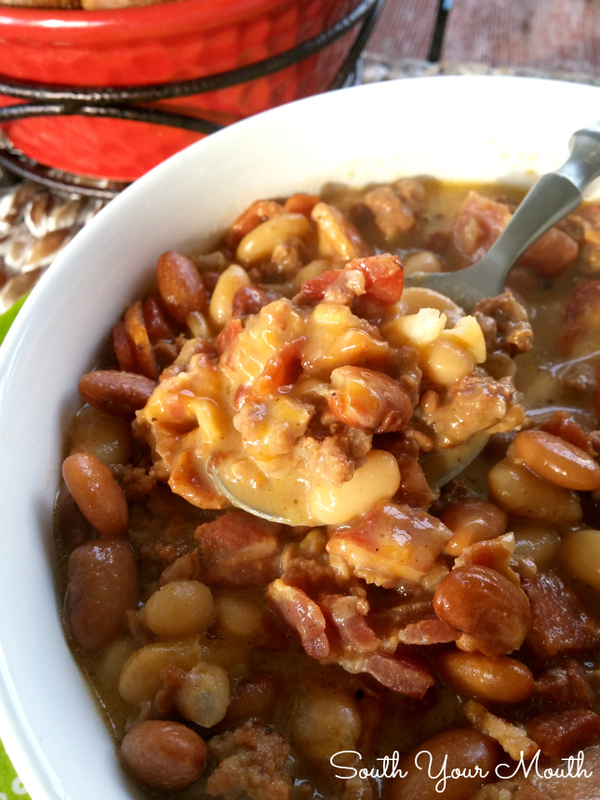 So when I saw that Hurst’s Beans made a ‘Bacon & Beans’ soup mix for the crock pot I couldn’t wait to jump on it! I had an idea brewing for something a little different but thought I better try it out on him before I got started because he does. not. like. change. Me: Which would you rather have? Bean & Bacon Soup or Bean & Bacon Cheeseburger Soup? Husband: Shut up. Is that even a thing? Me: Well, it could be. Does that sound like something you’d like? Husband: Like, you’d just put hamburger meat and cheese in it? Yes, I want that. A lot of it. What I LOVE about this soup is that it’s super hearty. I always found regular Bean & Bacon soup to be a little puny on its own. I want some MEAT in my soup. 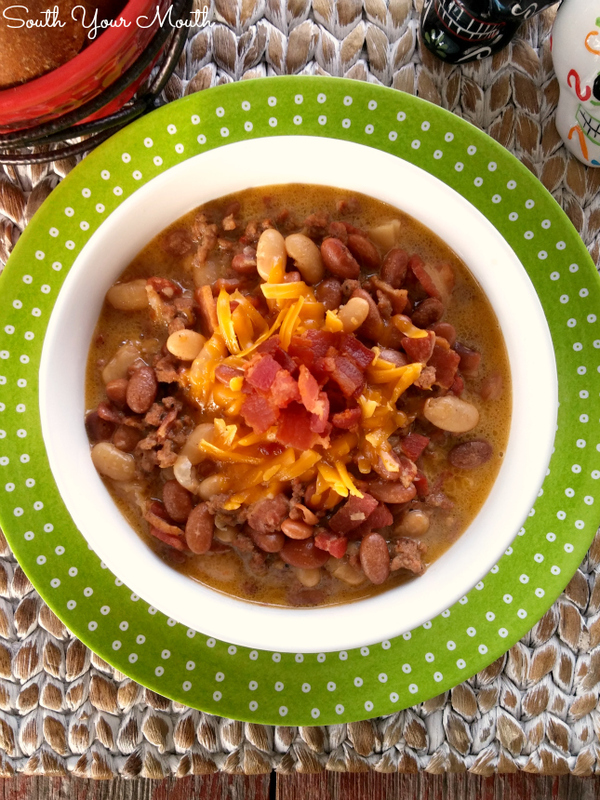 This has all the smoky goodness of traditional Bean & Bacon soup with chunks of ground beef and gobs of creamy cheese. It is so good! I portioned our leftovers into plastic containers and popped them in the freezer for the next time my tribe needs a good lunch and I can’t be there to cook one for them! 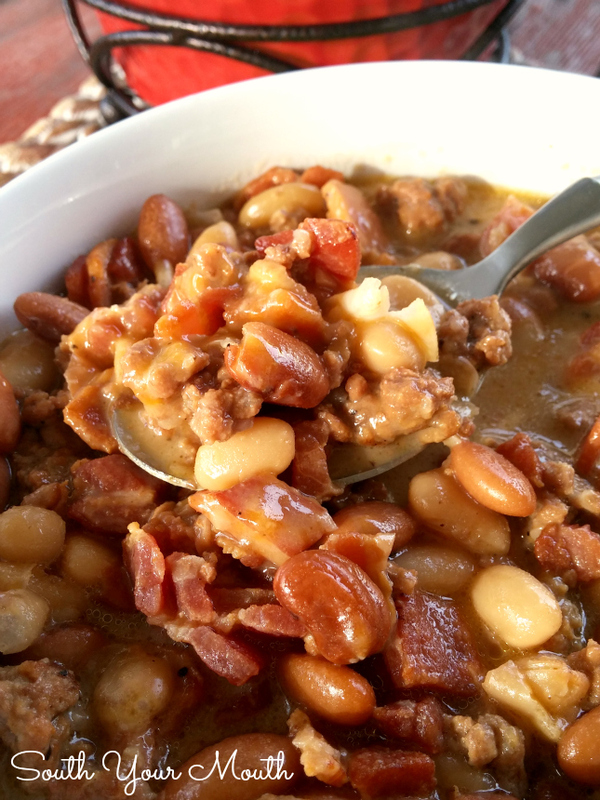 If you can’t find Hurst’s Bacon & Beans Slow Cooker Soup Mix in your local grocery store, ask for them! My grocery store now carries all sorts of products they didn’t have before simply because I asked for them. Just ask the cashier who to talk to to request a product and s/he will point you in the right direction. My store has a list at the Customer Service desk where they notate products their customers' request. Combine beans (beans only – do not add the flavor packet yet), broth and water in a large slow cooker and cook on high for four hours. Add ground beef and onion to a large skillet. Season liberally with pepper and garlic powder then cook over high heat until beef is cooked through and seared nicely. Add contents of skillet to slow cooker. Don’t drain. So long as you use lean ground beef and cook at a high temperature there shouldn’t be an excessive amount of pan drippings. Cut bacon into small pieces then cook until crispy in a large skillet. Drain on paper towels then add bacon to slow cooker, reserving about a cup for garnish if desired. Add seasoning packet from beans, worcestershire sauce and additional pepper and garlic powder to taste to slow cooker, stir well and cover. Reduce heat to low then continue cooking for 4-6 hours or until beans are very tender. Add half & half and 1 1/2 cups shredded cheese to slow cooker and stir well. Serve with reserved cheese and bacon pieces if desired. I didn’t use beef broth in this because I didn’t want the stock to be too dark in color but you can certainly use it if you’d like! If you can’t find Hurst’s Bacon & Beans Slow Cooker Soup Mix in your market, please ask your grocer for them. Until then, you use any dried white bean (great northern beans, navy beans, cannellini beans, small lima beans, etc.) then add salt to taste and 2 teaspoons Liquid Smoke. You can also order them online! You can absolutely cook this on the stove! 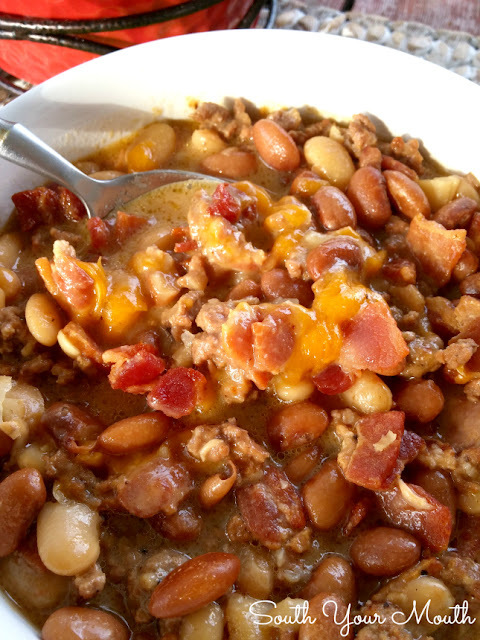 Keep pot at a simmer for 4 hours to cook the beans during the first part of the recipe then continue cooking for about 2 hours once you add the bacon and ground beef or until beans are tender. 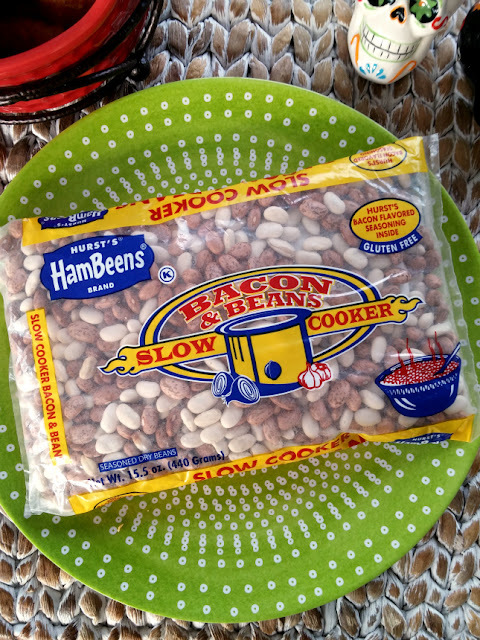 Are the slow cooker beans some how different and specifically designed for crock pots? If regular dried beans are used in a pinch, do they take longer to cook? OK, I could open a restaurant with this soup. I changed it up a bit, used 100% grassfed ground beef with double the onions, added carrots, celery, several garlic cloves instead of powder, used a 20 oz package of Hurst's 15 bean mix because that's all I could find (it didn't specify for slow cooker, but worked fine), 4 cups of free range chicken broth, 4 cups of organic beef broth and some tomato juice. I needed more liquid for the extra beans. I added bay leaves and Grill Mate's Applewood rub. Wow! This is utterly the best soup ever and I even forgot the cheese which I love, but it was over the moon without it. Thank-you sweet Southern sister for sharing this inspiration. Ya'll have got to make this! I'm really looking forward to trying this one. I had to order the beans so it will be next week before I can though. Do you think you could use ground turkey and turkey bacon instead of the hamburger and bacon? Sure! Give it a shot! Sounds delish. wondering what the nutrition label would be on this. I know that beans are a no-no when it comes to low carb/ carb free. I wonder if this could be adapted to a electric pressure cooker recipe.